Another passage from Against the Tides; we just can't help ourselves. Here, Cordelia Dean is actually quoting the conclusions of a report written in 1981 by a group of coastal geologists and signed off by many more experts in the same field of study. Their intent was to convince local, state and federal policy makers to restrict development on American beaches. Nobody listened. Considering recent meteorological events, perhaps government officials may want to buy them lunch and do some coastal policy pow-wow. 1. People are directly responsible for the “erosion problem” by constructing buildings near the beach. For practical purposes, there is no erosion problem where there are no buildings or farms. 2. Fixed shoreline structures (breakwaters, groins, seawalls, etc.) can be successful in prolonging the life of beach buildings. However, they almost always accelerate the natural rate of beach erosion...in the immediate vicinity of structures or...along adjacent shorelines sometimes miles away. 3. Most shoreline stabilization projects protect property, not beaches. The protected property belongs to a few individuals relative to the number of Americans who use beaches. If left alone, beaches will always be present, even if they are moving landward. 4. 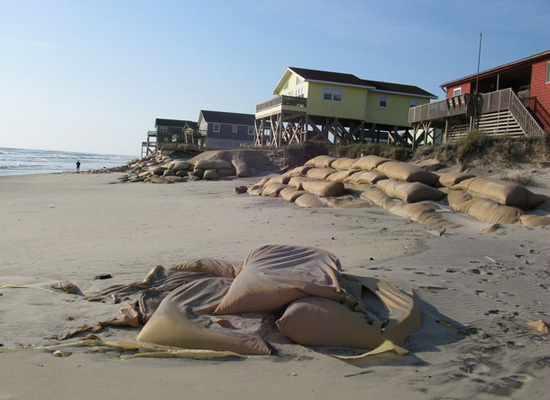 The cost of saving beach property by stabilization is very high. Often it is greater than the value of the property to be saved especially if long range costs are considered. 5. Shoreline stabilization in the long run (10 to 100 years) usually results in severe degradation or total loss of valuable natural resource, the open ocean beach. 6. Historical data show that shoreline stabilization is irreversible. Once a beach has been stabilized, it will almost remain in a stabilized state of increasing cost to the taxpayer. The state legislature proposed the new law because it was tired of spending millions of tax dollars to restore beaches eroded by nature each year around houses built on the coastline. Limiting development near the shore would reduce costs to the state of storm damage, disaster response and erosion. If left alone, beaches will always be present, even if they are moving landward. Heh, and there's your problem. How long will you trade beaches for livable land? Until the beaches begin to move seaward. It seems that more of a commons-type approach to land use would make sense. I don't think its inherently awful or unsustainable to have people living in close proximity to the coast, but our system of land ownership doesn't work the way it does in more geo/hydrologically stable areas. You could imagine a situation in which people who lose their land are given rights to build in areas down the coast where land is being created through the same processes. Very true. Broadly speaking, it can be sustainable as long as the very few who live on the coast can afford and eternally can keep affording the often exorbitant price of living on the beach and do not run to government when danger is imminent or after a disaster has struck begging for the tax money of the very many who doesn't benefit much from bailing them out. The problem with this is that in a lot of cases coastal erosion is worse downdrift because of shore fortification (seawalls, groynes, revetments, etc.) updrift. In general, the most sensible strategy is full retreat, but we all know that, for a grab bag of reasons, that's not going to be carried out anytime soon. And therein lies our fascination.